The former building for the Downtown Orlando Post Office, located at 44 East Central Boulevard in Downtown, Orlando, Florida. From 1917 to 1941, the Orlando post office was housed in a building on the corner of Central Boulevard and Court Avenue and was known as the Federal Building. This building was home to the post office and Internal Revenue Service (IRS) offices, and was the meeting place for the World War II draft committee. 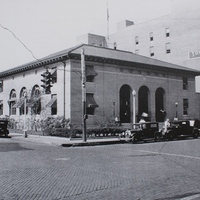 In 1941, the post office moved to its new location on Jefferson Street, but the Federal Building remained. In 1962, the Federal Building was bought by Ivey’s department store. The building was demolished to make room for a new parking lot. Today, the location is home to a BankUnited. Original black and white photographic print, 1933: Orlando Remembered Exhibit, Downtown Orlando Post Office, Downtown Orlando, Florida. Digital reproduction of original black and white photographic print, 1933. Prior to moving to this location, the Post Office and the IRS offices were located at Central and Court Streets. The WWII Draft Committee also met in this building prior to the war. This photo was taken in 1933. “Federal Building, 1933.” RICHES of Central Florida accessed April 24, 2019, https://richesmi.cah.ucf.edu/omeka/items/show/5573.